For our Genesis Pure Canada - My gentle hill we have selected high quality and particularly easily digestible animal protein sources such as fresh pheasant, fresh boar and fresh chicken. 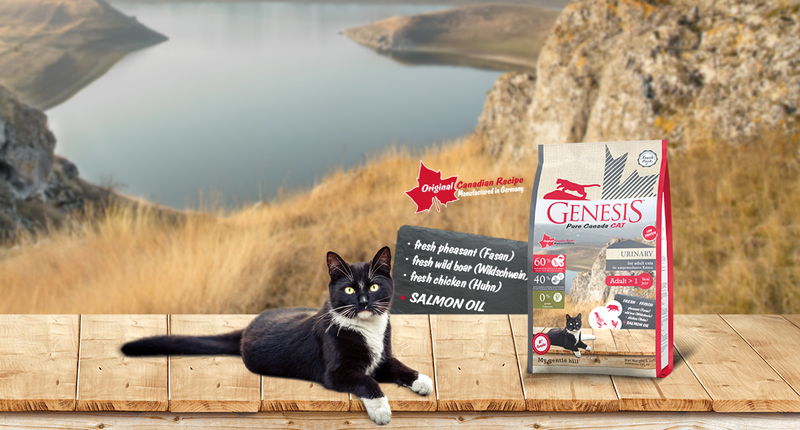 Genesis Pure Canada - My gentle hill is ideal for all adult cats with a sensitive urinary tract. Due to the radical reduction of protein and minerals (e.g. magnesium) and the subsequent reduction of urophanic toxins, Genesis Pure Canada - My gentle hill eases the load on kidneys and the urinary laxative organs by nutritional means. The combination of lowsugar plantain and easily digestible potato as source of energy has shown great results in the diet of sensitive cats. Pumpkin serves as a high quality fibre carrier that is rich in natural minerals. Cranberries and blueberries secure the vitality and well-being of your cat. You pamper your cat with wholesome and grain free food. The special selection of carbohydrate sources ensures a low glycemic index. The addition of our GI2 complex* (brewer‘s yeast) not only positively affects the intestinal flora of your cat, but also the immune system as a whole. Genesis Pure Canada - My gentle hill relieves the kidneys and the urinary organs by means of nutritional physiology due to its reduced content of proteins and minerals (e.g. magnesium) and the associated reduction of uremic degradation products. Fresh chicken (42 %), potato starch (15 %), plantain (dehydrated, 10 %), poultry fat, fresh pheasant (6 %), fresh liver, hydrolysed protein, liver (dehydrated), fresh wild boar (2 %), pumpkin (dehydrated, 1 %), calcium carbonate, psyllium seeds (psyllium), salmon oil (0.5 %), yeast (dehydrated, 0.15 % mannanoligo saccharides, 0.15 % β-Glucan), mussel meat meal, cranberry (dehydrated, 0.15 %), blueberry (dehydrated, 0.15 %), blooms of marigold (dehydrated), chicory (dried), yucca (dehydrated).